I like to pick the best recipes for each type of cuisine and simplify and Americanize them. 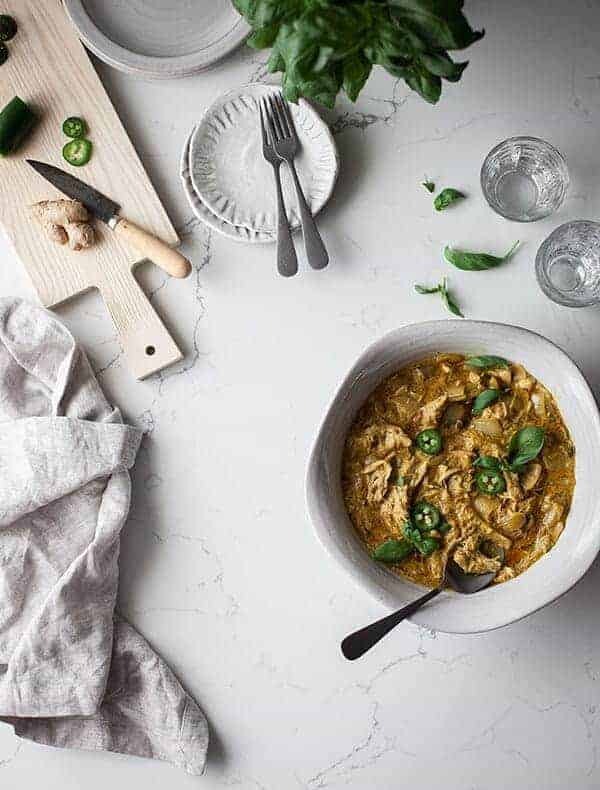 This Thai chicken curry with coconut milk and basil recipe is a good example of that. It’s traditionally a Thai recipe, but I’ve adapted it for the crockpot – because, well, the crock pot is awesome. My older children love this dish, my third child hates anything with chicken in it, so she doesn’t count, and my youngest won’t eat anything with a sauce on it, so that only kind of counts – because she is definitely not the only child with that opinion. But I LOVE it. I especially love it with fresh basil that I grow in my house. This and chimichurri sauce are two of my favorite uses for my fresh basil. I grow my basil in my office, which is technically the living room since it’s the room you see right when you come in the house. But in my house, you walk into a “greenhouse” with tons of plants and herbs growing on wire shelves with grow lights. It’s my sanctuary, especially in the winter. I also grow most of the flowers, vegetables, and herbs that I grow in our yard too. Every time I use chicken thighs in a recipe someone asks me if they can substitute chicken breasts. Sure. I suppose you can, but chicken breasts are meant for recipes you cook with high heat quickly, like chicken nuggets, pieces of chicken in pasta or in my lemon chicken. Chicken thighs are best for recipes where you cook low and slow, like this one! Using chicken thighs in a crock pot makes them really tender and it’s a lot harder to dry out chicken thighs. Chicken breasts in this recipe would be tough and dry. Bonus! Chicken thighs are usually cheaper than chicken breasts. I often make this recipe in a pan on the stovetop. It’s pretty much the same process. Just let it cook until the chicken is nice and tender, about an hour or so. If you haven’t tried coconut milk in the crock pot before, you will be pleasantly surprised at how well it tenderizes the meat. This can easily be made in the Instant Pot. Just throw everything in up until the tapioca starch and push the Meat button. Tender like the crockpot and much faster. I’m really picky about my spices. I really do think that the Spice Hunter curry is the bomb (and no one is paying me to tell you that). They just have so much more flavor than other spices, especially their curry powder. 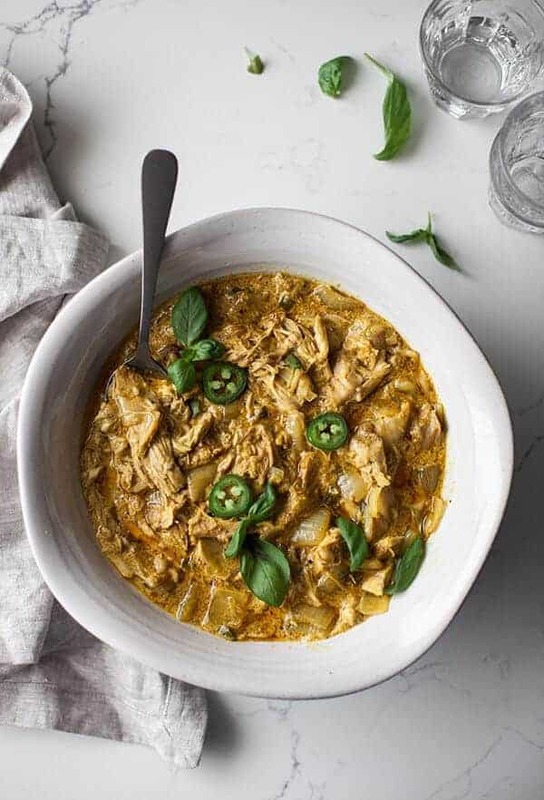 This instant pot chicken curry recipe is so easy to put in the Instant Pot and come back in a little over half an hour and have a healthy, flavorful meal! I’m in love with my Instant Pot and with Indian food. 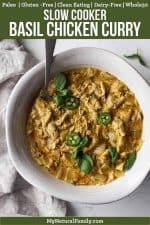 It all started with my Easy Clean Chicken Korma recipe and now this instant pot chicken curry is one of my favorite recipes. I love that I can throw all the ingredients in my Instant Pot and then at the end just add some lime juice and a bunch of fresh basil from my kitchen herb garden. And hey, if you don’t have a kitchen herb garden, like I do, try buying the basil plants I’ve seen at several grocery stores and use the top half for this recipe and give it a try to grow the rest of it in your house in a sunny window or with a plant light on them. I use frozen chicken thighs all the time, so don’t be afraid to try that. The only difference is it takes a bit longer to come to pressure. This recipe really is better with chicken thighs, not breasts. Breasts would come out really dry and not nearly as flavorful. I’ve stopped bothering with fresh ginger myself and just put two drops of ginger essential oil in. Just make sure it’s food-grade quality. If you have children who don’t think they like onions, cut them really small. They will pretty much disintegrate to nothing in the Instant Pot. I love the jalapeno in this recipe, but it’s not necessary. I really do prefer the Spice Hunter brand of curry powder – and no one is paying me to tell you this. It’s just good and fresh and flavorful. If I don’t have fresh limes on hand, I use two drops of lime essential oil instead. Personally, if I don’t have fresh basil on hand, I don’t make this recipe. It’s not the same at all with dry basil. This recipe would also work just fine in a crock pot. Pretty much the same thing, just cook it on low for 8 hours or high for 4 hours. I’ve made this recipe on the stovetop plenty of times too. Just use the ingredients in this recipe but follow the “Traditional Preparation” instructions on this recipe. Please let me know if you try this instant pot chicken curry recipe and what you think. It’s a staple in our house and I hope it will be in your house too! Paleo Chicken Recipes for Any Meal Anytime Anywhere! This coconut curry chicken recipe gets so tender and flavorful in the crock pot. I crave it all the time! Place the chicken in a slow cooker and pour the coconut milk over the top. Place the lid on the slow cooker and turn the heat to medium for an 8 hour cook time, or high, for a 4 hour cook time. One hour before the chicken is finished cooking, place the coconut oil in a saute pan and melt over medium/high heat. Add the onion and jalapeno to the pan and saute for 3-4 minutes, or until onion begins to soften. Add the garlic, ginger, salt, curry powder, and tapioca starch. Stir into the vegetables until coated and saute for another 30 seconds. Add the vegetables to the slow cooker and gently stir in until combined. Let curry cook for another 45 minutes to an hour. Liquid should thicken slightly in this time. Taste the curry and add salt and pepper, as needed. Lightly shred the chicken. Add the lime juice and basil to the curry and stir until leaves are distributed through the curry. Serve hot over your choice of “rice,” such as cauliflower rice, brown rice, Jasmine rice, quinoa, etc. Place everything but the coconut oil, tapioca starch, lime and basil in the Instant Pot. Place the lid on the Instant Pot and push the Chicken button so it cooks for 15 minutes at high pressure. Let come off pressure on its own (in reality I usually wait about 10 minutes cause I want to eat it and it’s close enough to off pressure by then). Open the lid and taste the curry and add salt and pepper to taste. Lightly shred the chicken (I often just shred it with a spoon since it gets so tender in the Instant Pot). If you like your sauce thin you may move to the next step. If you like it thicker, push the saute button for a few minutes and cook off some of the liquid or mix the tapioca starch with a little cold water in a separate cup and stir. Then add to the curry and saute for a minute or so. Turn off the Instant Pot then add the lime juice and basil to the curry and stir until leaves are distributed through the curry. Serve hot over your choice of “rice,” such as cauliflower rice, brown rice, Jasmine rice, quinoa, etc. To cook from frozen chicken thighs, increase the time under pressure to 20-25 mins (instead of 15). Experiment with this timing as it may vary depending on the size of your frozen chicken thighs. For best results, do a natural release. If you want to do a quick release, you will need to increase the time under pressure. If the internal temperature of the chicken thighs isn’t high enough (at least 74C (165 F)), cook longer. Does this keep if frozen? I haven’t tried it myself but I’ve tried similar things and they have worked well. I just wouldn’t freeze the carb with the curry or it will absorb all the liquid. I’m trying this recipe tonight. It sounds delicious. As a matey of fact, I was salivating while shopping for the ingredients! I would love to know if you like how it turned out! Good to hear – and thanks for the ideas of modifications. I’m sure other readers will find them useful. 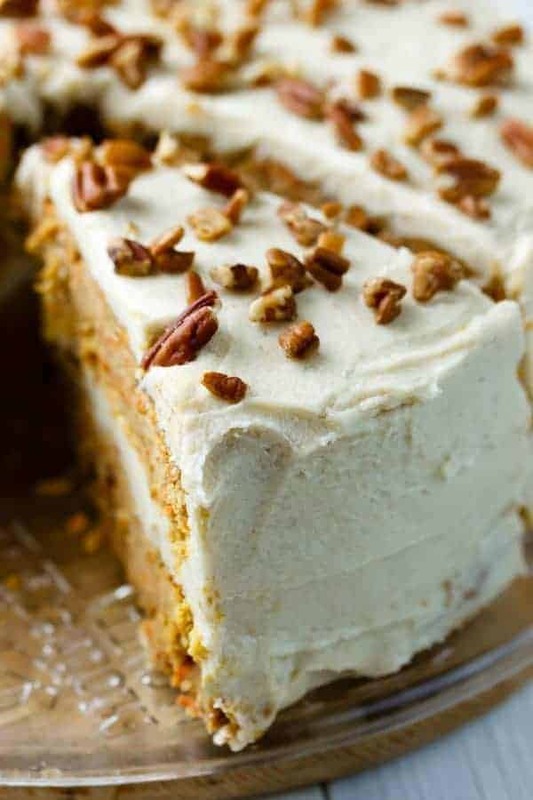 Have you tried this recipe with light coconut milk? Does that do anything to the flavor? I haven’t. I love the full fat. . .
Hi! If we use the IP method, do we ever need to add in the tapioca at some point or can we just skip it? I usually just skip it. It’s only to thicken it and if you don’t mind it thinner and more like soup, just skip it. Thanks for this recipe. I love the fresh basil! I’m glad you like it. Thanks for taking the time to comment!